A few days ago I was pruning back the over growth of our grape vines. So many really good looking runs had to go. Reminding me of the careful, loving hands of God, that prunes us back for reasons of fruitfulness, and viability. To save our lives, and to ensure kingdom productivity. This means He does everything in His power to finish the good work that he has begun in us, as the author and finisher of our faith. From the faithful son to the prodigal. His goal is to bring us home, that we can abide with Him, in His House. God the Father is the Lord of the harvest, and resides over this work of salvation being wrought in the earth. Him who desires that no man perish; but, that all will come into the knowledge of the son. At the time that I was pruning my grape vines, this article began to trend on my website. So I’m taking that as a sign it’s a word for the season. – God bless. Recently, the Lord gave me a picture. I saw a tree, it was in great shape. A nice full tree with viable limbs and thick with foliage. As I was observing this tree all of a sudden a branch grew out from one of the limbs, and as it grew I began to notice that it was a dead branch. Now how can a dead branch grow? Read: For The Sake Of Fruitfulness by clicking the link below, the article will answer the following questions, and more. 1.What is the destruction of the flesh? 2. What exactly are works of the flesh? 3. When does mercy end and judgment begins? It appears that there are many reasons to prepare for trouble on the pacific rim of the west coast. On June 7th there will begin safety drills all along the area. According to many news outlets including Charisma Magazine. I felt it was time to release these prophetic dreams kept private, all these years. It seems now there are just too many confirmations for me to continue to ignore the need to publish them. They are warnings for America, for prayer, and preparation. Take serious the evacuation warnings when they come. Pray that there will be time for them. Repent; that the Father and HIS Son- the Lord Jesus Christ; who has been rejected by so many, may be received to do what HE longs to do. That is to heal our land, and save all who are lost- that call out to him. Expect the un-expected, remembering to watch and pray. David Wilkerson the evangelist and prophet said a great earthquake would happen, possibly after a devestating one in Japan. It may NOT be where people may think. God is a very present help in times of trouble. For more that includes the following Headlines-Follow the Links. But concerning the times and the seasons, brethren, you have no need that I should write to you. For you yourselves know perfectly that the day of the Lord so comes as a thief in the night. For when they say, “Peace and safety!” then sudden destruction comes upon them, as labor pains upon a pregnant woman. And they shall not escape. But you, brethren, are not in darkness, so that this Day should overtake you as a thief. You are all sons of light and sons of the day. We are not of the night nor of darkness. Therefore let us not sleep, as others do, but let us watch and be sober. For those who sleep, sleep at night, and those who get drunk are drunk at night. But let us who are of the day be sober, putting on the breastplate of faith and love, and as a helmet the hope of salvation. For God did not appoint us to wrath, but to obtain salvation through our Lord Jesus Christ, who died for us, that whether we wake or sleep, we should live together with Him. Edify: to teach, improve, build or establish. To enlighten, uplift or inform. I was in the market place and went to take an elevator to get to another floor. When the doors opened and I was just about to step in, it shocked me to discover there was nothing there but an open shaft, and cables. I was struck by how easily I COULD HAVE fallen into this open shaft. The first thing I thought of was the people who would not be careful to look, as I did, before stepping in. I went back to those whom I was standing with prior, and warned them of the elevator. We all stood and watched again as the elevator doors opened wide, this time the carriage was misaligned and tipped, leaving a gap wide enough to fall through. Strangely, there were those still enticed to get on board anyway, knowing the elevator was broken, taking the chance that it wouldn’t plunge downward while they were in it. I thought to go to the central desk of this international discount store, where it could be better broadcasted that the condition of the elevator was dangerous, while the group above watched the shaft. Getting to the central office seemed cumbersome and I had to go through a lot of effort just to get to the front desk. I hoped and prayed no one would plunge down the broken elevator shaft, before I could get there. Thankful, for those who were standing watch, I worried of their due diligence in warning the patrons on other floors. Finally, in reaching the central service center where there was a line, I realized that I was going to have to move to the front of the line, to get out my warning. As I began doing so I was explaining to the front counter, ( and those in line) about the elevator, the front desk manager reached for the main phone to contact central management. But, as I began to speak a Christian woman walked up to me who had nothing to do with the desk, and postured herself to address the situation under a false authority, motivated by a theological position, rather than the Spirit of God. She immediately began to play down the sense of urgency by addressing the warning as fear, discarding it because it wasn’t a positive word; but, rather, I was speaking death. I knew this woman was out of order, and seriously misguided. Still, she had a presence about her, and a boldness. But, what alarmed me the most was that even though the message was clear and precise, the desk personnel stepped back from the intercom, confused; with a hint of embarrassment in her face that she had begun to respond to my initial warning. And yes, you guessed it. This was a dream. Dream continued: The atmosphere changed and it seemed as if all reason bowed to the illusion that this woman’s counter posture against the sound of alarm, bore a reasonable reaction. All motion toward alerting shoppers, and rendering them directives around the broken elevator, while dispatching maintenance, became suspended. I remember looking around the room amazed how she neutralized the urgency of the warning, while interrupting the natural protocol needed to avoid a potential disaster. Can you imagine an elevator like that broken, with out being put out of order? No yellow tape, no orange cones? No maintenance, or repair being assigned to it? The dream outlined the lunacy of reacting that way to a clear and present danger. Even the liability concerns of those in charge to alert maintenance. But, no one did anything. Yet, this kind of reaction to prophetic words and ministries called to blow the trumpet in Zion, is carried out every day. (Putting aside the dreams dual references of misalignments, including what is taking place in the market place. And the potential ramification of those that are still trying to board an obvious disaster hanging on a thread … ) I came away from the dream with a more pressing concern, however, and that was how to convince those who have the power to save lives now, not listen to the soothsayers of our times. I knew this character in the dream was presenting the fallacy of an error that stemmed from false teaching on the office of a prophet, and what the mercy of God truly looks, and sounds like. Even how the positive confession era has created an imbalance among many. Displacing common sense in many prophetic circles. (This parallels with the elevator scene where a man is trying to board a seriously misaligned car in a shaft where he could be terribly injured. A clear and precise word is required in a split second with no time to couch the issue, such as “STOP or you will DIE!” Is that not a positive word? How about this one- “Your sins are forgiven, go and sin no more, less a worse thing COME UPON YOU!” Certainly, we are swinging back from the pendulum where words of warning described the disaster, but not the directives to avoid it, or the wisdom to walk through it. Leaving, the receiver under a cloud of fear and even torment. This is not the heart of the Father. His dealings with men are forever seeking to lead us to repentance. We need to understand the value of what true prophetic ministry is. Oddly, present in the dream was an atmosphere- a peer pressure of sorts, where sounding off the alarm could potentially make one appear foolish, and this, also, over ruled the good judgement of those in charge of managing crisis. The fact of the matter was her attempt to put forth a false sense of security, while dowsing the impact of the voice of alarm, immediately, aligned herself in judgement of those WATCHMEN who would NOT sound the alarm to warn the people when disaster is imminent. A cable holding up the MISALIGNED elevator car, (that is suppose to facilitate safe departure and arrivals), is about to suffer a catastrophic failure. Woe to those who cry, Peace! Peace! For sudden destruction shall come upon them. Woe to those who are manipulating common sense responses to crisis in order to create a false sense of security! Woe, to those regarding prophetic warning; who muddy the waters of clear and concise prophetic detail, to give it a positive spin. They say to the seers, “See no more visions!” and to the prophets, “Give us no more visions of what is right! Tell us pleasant things, prophesy illusions. They dress the wound of my people as though it were not serious. “Peace, peace,” they say, when there is no peace. This is what the LORD says: “As for the prophets who lead my people astray, they proclaim ‘peace’ if they have something to eat, but prepare to wage war against anyone who refuses to feed them. For those who have experienced this kind of boldness to shut down the spirit of the voice of alarm, in a mission to save lives, know that our responsibility to prevail with the warning is not lifted. For if they HEAR, and do not respond, we’re not responsible. But if the warning is dampened or hampered it is still for the watchmen to press on and persevere. We see how Paul did this in the passage below but first let’s remember, many of the prophets were threatened, beaten, incarcerated, driven out of regions for their sound of alarm. That spirit that declares peace in lue of warning, is in bed with Anti Christ, false prophets, Jezebel, Ahab; the foolish servant, and if nothing more is a FEAR FILLED Christian who does not understanding that the mercy of God is present in warning, correction, and rebuke, as well as a form of strengthening, and edification of the saints. Certainly, our words should be full of life, but many in the body misunderstand the dynamics that sustain and strengthen Kingdom life. Identifying a breach in the wall, is commendable in most vocations, and approaching those where that message will be most effective, makes sense. Of course, it would be blocked off as any breach would with special attention, and inspected, with inquiries to why it failed. Warnings in evangelism through out history have moved many to repentance, it is mercy that exposes our hearts, so that we will not die in our sin. Pronouncements of judgements with out either an opportunity to repent or instructions to do so, is not the heart of the Father. In the new testament, in the acts of the saints, we see occasions where confrontations occur and hard words are spoken. We have the account of Peter’s dealing with Ananias and Sapphira who lied to the Holy Ghost, and Simon, who thought to purchase Him. A firm warning to the readers that we are not to grieve the Holy Spirit, or lie to him. These dealings are no less critical now than they were in the beginning. This is why I warn those now who would posture themselves over words of the prophets of God, to dilute their impact, or divert their intent- If they succeed and lives are lost, the blood will be on their hands. Warnings, through the Spirit, in there nature are acts of mercy, pronounced judgements with instructions for repentance, the same. We see that in the delayed judgement of Nineveh that saved a whole generation, in the story of Jonah. Now we see how Paul dealt with someone who was a Jew and called a prophet; but, in this passage was identified as a false prophet. In some translations a sorcerer. Many do not realize that operating in the flesh is operating in witchcraft because witchcraft is called a work of the flesh. Therefore, meddling with the Holy Ghost ministry under the guise of prophetic ministry, is deemed as sorcery according to scripture. In this dream this woman was acting out in the flesh. The following is how NEW TESTAMENT apostolic ministry dealt with in-house sorcery. So, being sent out by the Holy Spirit, they went down to Seleucia, and from there they sailed to Cyprus. When they arrived at Salamis, they proclaimed the word of God in the synagogues of the Jews. And they had John to assist them. When they had gone through the whole island as far as Paphos, they came upon a certain magician, a Jewish false prophet named Bar-Jesus. He was with the proconsul, Sergius Paulus, a man of intelligence, who summoned Barnabas and Saul and sought to hear the word of God, but, Elymas the magician (for that is the meaning of his name) opposed them, seeking to turn the proconsul away from the faith. But, Saul, who was also called Paul, filled with the Holy Spirit, looked intently at him and said, “You son of the devil, you enemy of all righteousness, full of all deceit and villainy, will you not stop making crooked the straight paths of the Lord? And now, behold, the hand of the Lord is upon you, and you will be blind and unable to see the sun for a time.” Immediately mist and darkness fell upon him, and he went about seeking people to lead him by the hand. Then the proconsul believed, when he saw what had occurred, for he was astonished at the teaching of the Lord. Notice how this very powerful occurrence upon the word of Paul, immediately coming to pass, acted as a sign to the proconsul? We will discuss amazing accuracy upon the word of the prophets, later. But, keep this demonstration or “sign” in mind. Simon the ex sorcerer, attached himself to the apostolic ministry of Peter, after he believes; but, makes a serious mistake when mishandling the subject of the Holy Spirit, by asking to purchase the Holy Ghost! … More reasons not to grieve God, in those things pertaining to His Holy Spirit and giftings; but, look here, Peter had a WORD for this man, and it scared him into a sobriety that may have saved his soul. But I wonder, in some of these prophetic climates today would such a “WORD” be received? Or, for that matter would such a word dare to be given? Peter answered: “May your money perish with you, because you thought you could buy the gift of God with money! You have no part or share in this ministry, because your heart is not right before God. Repent of this wickedness and pray to the Lord in the hope that he may forgive you for having such a thought in your heart. For I see that you are full of bitterness and captive to sin. “Then Simon answered, “Pray to the Lord for me so that nothing you have said may happen to me.”After they had further proclaimed the word of the Lord and testified about Jesus, Peter and John returned to Jerusalem, preaching the gospel in many Samaritan village. Still, it is our responsibility to let the prophets speak and the others stand and judge. We do this in our assemblies, in our meetings, should the word of prophecy be handled with any less care in the internet market place, that is increasingly being used as a tool of ministry? As believers, self governing in these issues will please God, contrarily, wilfulness and recklessness, will not. In fact, what we do or undo in relation to His prophetic word, will be examined, and we will be made accountable on how we handled or mis handled, even, the Word of Life, in all true prophecy. For the REVELATION of JESUS CHRIST is the SPIRIT of PROPHECY. Now back to IMPROVE, BUILDING UP, ESTABLISHING, and EDIFICATION. WE who are of the day are not appointed to wrath! Yet, we are reminded to stay awake and alert. To watch and pray. To make ourselves ready! So, who does this? Is it not the watchmen of the night who sound the alarm? What would become of those who cried peace in the day of wrath? Sudden destruction shall come upon them. Again, let me point out three of those words that define edification. TO IMPROVE. Do we not remove waste when we are improving? TO BUILD. Do we not clear the ground of roots and rocks when we lay a foundation? TO ESTABLISH! Once the building is built how shall it remain? I was in property management for many years and one of my duties was to oversee the building and property maintenance. To see to it that structures were regularly examined, maintained, and repaired. That elevators had updated permits, and safety checks, properly licensed for use. Clearly witnessing what materials are good and for the edification of a structure, and what is not. Cheap material and sloppy repairs NEVER work for the long haul; although, cosmetically, they may get you by for a season. This is reflective of those who always have a positive message, but no substance. The material is easy to come by and cheap, but has no enduring value. Untempered mortar. To improve, edify, build up, and establish; also, involves removing the broken, to replace the new- and you can ask a plumber about the messiness of some of these jobs that require the removal of debris, first, before repairs ensue. In fact, many chronic problems would warrant a complete revamp with new materials, updates, and remodels. This is Kingdom building and the tearing down of the old along with its removal, is all for the edification of the saints. It requires all of this to improve, build up, and “edify”. This takes skill, and requires the workings of the five fold ministry to accomplish a complete revamp. No one wants unskilled labor to remodel their home. Neither does God. Each anointing has its responsibility to accomplish that work. Even a visionary sees what has to go before he SEES what will replace it, those things are skillfully communicated, by those who stand and judge. This is why every word should have a prophetic conference to discern its timing and to activate, appropriately, its levels of realization. That is why the Lord, warned me to beware of the foulers, dowsers, disclaimers, and the distractors, of prophetic flows. The fouler poisons the original intent of the word given, by quickly introducing a counter thought, the dowsers will quench its fire because of the strength of the word, they will attempt to “cool it down” for the luke warm seeking pallet. This modifies the word’s impact, and meddles with God’s original intent for the word or warning. I’m not speaking of those who run around screaming the wolves are coming- out of conjecture, that certain things are about to happen, by watching natural events unfold- I am talking about prophetic ministry that receives news headlines from the Spirit of God. Fight or flight, build or tear down, the Church should be ahead of what is real and what is rumor. This is why it is dangerous to be this woman depicted in the dream, she promotes soothe saying and frustrates prophetic warning and sways administrations to disobey true spiritual authority, this can only be our age old enemy, Jezebel. The “disclaimer” of prophetic warning immediately begins to reverse the momentum of impact. The “distractors” will often be the ones who quickly raise up controversy, again, to misdirect the flow of the word in order to bury it. Beware of SEED THIEVES! We are called to be vessels of the DOVE not keeper of THE CROWS. Think about it like this- when you hear a prophetic warning because the WORD OF GOD is like a seed sown into the ground. What fruit will it potentially bear in the good soil of our hearts? The Lord once showed me that a man and his son would begin to suffer consequences of the lack of faith that was being spoken over their circumstances. That there would be a death of that which should be a blessing, in their lives. They changed their habit and all is well. What if they decided to not respond, because I pronounced a warning of death? You see, the word given to them to speak life over their circumstance went unheeded, and after awhile the fruit of the mouth (life or death is in the power of the tongue) began to manifest. As Christians, our non response to prophetic words and warnings are just as critical as our responses. They need to be carefully considered, biblically confirmed, or discarded with great care. In fact, some words should never be left unattended to. Because in them are life and death. Rejecting and dismissing words aimed to work havoc rather than salvation and peace, is clearing your shelves of a potential hazard, in the days to come. I don’t see where confusion over a prophetic word warrants it “to be put on the shelf’.” The biblical model, straight forward exposes false prophesy. That means it is examined until it is either received or rejected. Seeking the Lord on it may take some time; but, it is important to recall it before prophetic council where it will be judged, like the scripture says, “let the others [prophets] stand and judge.” That is why it is important to take personal words, spoken over us in private, before others. In fact, I often gather a few people around when I find that I have a word for someone to stand and judge, let the prophets do so, let them stand and judge; weigh it, wait on the Spirit; in Holy reverence towards the Father, regarding His prophetic ministry. I do the same when interpreting dreams through e-mail. We have a little disclaimer that instructs the dreamer, to take their interpretation before a group of trusted counsel. Though I never personally had to deal with a direct attack against a prophetic warning like that one played out in this dream- I have had many words that were quite lovely, not responded to. I’ve seen the results of that many times, finding that when you explain to people what the alternative is in some of these cases, they are more apt to respond. A couple years ago the lord showed me a vision of the Lion of Judah walking through the flames of revival as the high praises of God were sung and praised by a worship team on the platform of a spirit filled church. I delivered a prophetic word that went along with the vision, to the pastor who happily received the word, but in the weeks and months to follow he cut short worship, and often quenched it. I’m not saying he did this deliberately. But, normally when a move of God is prophesied to come OUT OF a certain thing one would explore that avenue of entry. If you believed the word is come from heaven. This is another reason we are told not to despise the word of prophesy, don’t disregard them, there’s purpose in that. With in a year the worship team I saw leading the High praises of God into that revival, lost key members who were there in the vision when it happened. We need to act on the word, not counter act. I’ve seen the aftermath of those who scoffed and discarded prophetic warning, whom at the same time were steeped in a very strong prophetic culture. Incredibly, I remember praying a hedge of protection over such a group and heard snickering because a Christian comedian had made light of the hedge prayer. Well, we had seen that comedian and heard the same thing too, and his point about it was funny; but, in practice there is nothing to discard about walls. In fact, at that time we were under a commission of GOD to: REPAIR THE BREACH IN THE WALL. Sadly, those who decided to mock the concept of THE HEDGE, and other prophetic warnings began to suffer a series of attacks; a few of them tragic, that are associated with broken walls, their hedge of protection was down. Even while we were executing these unheeded warnings I remember a real strange moment when a small child had disappeared in the group and was found outside in the street, because all the doors had been left open. Even after a scary object lesson such as that, our REPAIR THE BREACH IN THE WALL messages and prayers went mocked. Darker days ensued. Satan comes not but to kill, steal, and destroy. No WALLS, NO WATCHMAN. A few years ago I comforted a prophet weeping in shame because of the rebuke they received for warning another prophet of an attack against their spouse, in the area of illness. That warning was not received, and with in two years that minister’s spouse was dead of cancer, in the prime of life. When a watchman sees a dust cloud rising on the horizon, and doesn’t report it then what does the bible tell us about that prophet? Rest assured my brothers and sisters, at times you WILL BE CALLED A FOOL. But, the fool is the one who FEARS an evil report, attacks the watchman, and thinks ignoring it will make it go away. Even declaring there is no dust cloud on the horizon, it is only a little rain! When, in fact, it is a treacherous gang of murderous thieves. How about humbling ourselves and calling it what it is? Let’s respond by having a meeting in the war room with the Lord of Hosts for wisdom, knowledge, and understanding; for strategy, and approach. Rather than a heretical butterfly and pixy dust response that will turn watchman prayer gatherings into a bunny farm. While satan’s hordes advance. We have nothing to fear with our Father’s warnings. In them, we will win all our battles, when we inquire of HIM who teaches us, who trains our hands for battle, and our fingers for war. We should not be so quick to react to a word of prophecy, less we miss handle the word of truth, misdirect it, and bring judgement on ourselves. Of course, it is the nature of crows to steal the seed. Crows will be crows. But, the household of faith is held to a higher standard. Whether, we are in meeting at home, in our living rooms, at a cook-out with our neighbors; or, moving about the internet market place- in the days to come remarkable warnings and prophetic words are going to reach beyond the four walls of our Christian gathering places. It may be, at times, where social media will be used to quickly move groups of people out of harms way, when multiple prophets post the same thing at the same time. Can you imagine a culture of ‘prophetic seed thieving’ pecking away at words of prophecy in such a time as this, counteracting true watchmen ministry? (By the way, there are those who call themselves such a thing, that may have dreams and visions, habitually voicing them outside of biblical protocol, whom have no understanding of the true purpose of the seer. Thinking that predicting the future is the sum of prophetic ministry.) They are not watchman, but watch dogs; barking at anything that moves, with no clear and distinct intelligible words. There is a difference between yapping canines, and true WATCHMEN OF THE NIGHT. God is restoring the Spirit of the fear of the Lord, with exploits and demonstrations of HIS power that will accomplish their intended purpose. He will confirm His word with signs and wonders following. Is not “an event foretold” a sign? So then what was the word, or message that sign confirms? Every sign has a message that it is punctuating. If there is no message attached to a sign, then the ministry is a loud attention gatherer, like clanging brass cymbals, but has no substance ascribed to it. These kind “draw men unto themselves” who chase dreams, visions, and supernatural anomalies. A very spooky spiritual form of CLOUDS WITH NO RAIN. Too many ministries seek to validate their call using signs, forgetting they are there to confirm a true message from heaven. In fact, a ministry void of teaching and preaching the word of God, relying heavily on manifestations only, is one molecule away from the lying signs and wonders of the end times. Eventually, that ministry will succumb to fanaticism, and foolishness, that diverts attention away from the cross and sets it squarely on man. let us live soberly, as we rightly handle the word of truth, discerning the age we live in. … these men revile the things which they do not understand; and the things which they know by instinct, like unreasoning animals, by these things they are destroyed. Woe to them! For they have gone the way of Cain, and for pay they have rushed headlong into the error of Balaam, and perished in the rebellion of Korah.…These are the men who are hidden reefs in your love feasts when they feast with you without fear, caring for themselves; clouds without water, carried along by winds; autumn trees without fruit, doubly dead, uprooted; wild waves of the sea, casting up their own shame like foam; wandering stars, for whom the black darkness has been reserved forever. It was also about these men that Enoch, in the seventh generation from Adam, prophesied, saying, “Behold, the Lord came with many thousands of His holy ones. Amen and Amen. A side note to the dream that appears to have a message with in the message- Often the Lord will give us dreams and visions that have many facets of truth. I see this in the dream as well. Here is another more simple warning in regard to the open and unguarded shaft. We live in a world where the love of money is much like that elevator shaft. Getting in it is suppose to be a ride up or a ride down, as markets go. Not a plunge to our deaths. Not a lure to disaster, that is why we put our trust in Christ and our treasures in heaven, where moth and rust do not corrupt. To be lured into this world system over the love of money is imminent disaster, in these end times. How Not To Become A False Prophet- IN THE GOVERNMENTS OF GOD. A new episode at our Vantage Point Channel. Recommended. A prophetic word to the Sojourning BRIDE of CHRIST WHO LIVES in AMERICA. Who is the BRIDE of CHRIST? She is the one who is in love with him. SHE IS THE ONE WHO IS WAITING FOR HIM, making herself ready, day and night; watching. Longing for his return. I saw her walking through the battlefields of AMERICA from days gone by until NOW, and I heard The Lord say, “Come off this battlefield, there is victory for you to glory in, and a new GARMENT FOR YOU to wear.” JOIN THIS PODCAST for the details of the latest CHAPTER regarding the BRIDE OF CHRIST who lives in AMERICA, and HER new assignment IN CHRIST. I’m going to tell you about this thing that I have seen, and it is like the vision I wrote about regarding Syria and Turkey. The vision has a panoramic effect and seems to record an expedition like journey that runs from one continent to the other through out the earth from the beginning of the era of the Church, and I would imagine, will continue until the end of the Church era. This observance is something I simply seem to step in and out of, to observe momentarily from time to time in its progression. Like walking into the middle of a movie on a Saturday after noon, going out, and then coming back in to an on going, epic story, that progresses to other scenes, and locations, each time I visit the theater. This next vision that I am going to share is like a sequel to the Sacred Pilgrimage and Crimson Banner vision but now instead of being in Syria and Turkey, the location is in the land of Russia, with the scene opening up on a beautiful spring day at what appears to be Red Square. Vladimir of Kiev 956-1015 AD. Jesus- The words I speak to you are spirit and they must be spiritually discerned. There is a move of God, it is wonderful, powerful, it is the Holy nation, a peculiar people gathered in a moving assembly that is passing through the earth … and it is He, the Lord who is strong in battle, but He is not in war mode, He is in gathering mode, as He said, “I will gather all who will gather and return them to their land”. As the natural Jews are returning to Jerusalem from all nations and many places so ,also, is the Remnant Nation being gathered in an assembly of the righteous, carrying their banners, lifting them high, each tribe, among their tribe, and divided among their clans. Shall not this gathering ultimately join in His return, in a twinkling of the eye, with a shout, with the voice of the archangel, and the trumpet of God? Shall not this body full of death be clothed upon? For the everlasting life with in, shall be housed with an everlasting body, that wears not out, but carries the eternal destiny of living souls forever. Each clan has a banner, each tribe, also. Above those banners are the banners of the Lord, like the one that says, “His banner over me is love.” And the banners above all others, over each one, is crimson red, and they flow like a river above the procession of the righteous. So the lord Jehovah-Nissi the Lord our banner is passing by and assembling an assembly of the gathered, whose pilgrimage is in the spirit, passing through the nations of this earth. It is the only sound in the stillness of the hour, as the newly awakened betrothed falls into the ranks that have assembled, come again at the break of dawn. I hear the sound of many banners whipping in the wind, and it is all I can hear and the front of the line is moving out, who knew a mighty army, on a mission to gather, to recover, to compel was moving through the land? A breeze, they say has become a gale, but it is the sound of a river of banners in the wind. “Close your eyes and you will hear them, in the Spirit”, says the Lord. From the eagles eye view, the banners flow together like a river moving across the land. Though your sins be as scarlet red , I will wash them white as snow. 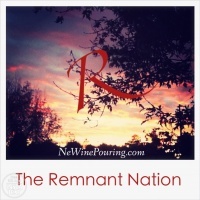 Shall not the Remnant Nation manifest His glory in the earth? What is her motto? We know her highest banner … is it not as was for Him (who is Her head) who is the fullness of the Godhead bodily? As He IS, shall she not be the same in the earth? It is written: The Spirit of the Lord GOD is upon me, Because the LORD has anointed me to bring good news to the afflicted; He has sent me to bind up the brokenhearted, to proclaim liberty to captives And freedom to prisoners; to proclaim the favorable year of the LORD And the day of vengeance of our God; To comfort all who mourn, to grant those who mourn in Zion, Giving them a garland instead of ashes, the oil of gladness instead of mourning. And there she goes from one destination to another, a moving assembly, through out all places in the earth, where she comes from can we know? Where she is going can we tell? As the Spirit, so the wind we can only know what is revealed, true also, for those who walk not according to their own understanding, but according to the leading of the Holy Spirit. Но мы получили не тот дух, который принадлежит миру, а тот Дух, который исходит от Бога, чтобы мы познали всё то, что нам было безвозмездно дано Богом. Мы говорим об этом не словами, которым научились через человеческую мудрость, а словами, преподанными нам Духом, толкуя духовные истины с помощью духовных слов. Недуховный человек не воспринимает тех истин, которые указывает Дух Божий, и, по его мнению, это глупость; он не может их понять, потому что они оцениваются духовно. That being said, the scripture also, says that He [God] confirms His word with signs and wonders following. The prophet seer, sees, and is able to interpret what he/she sees and teaches it to the Church. The visuals God gives to a prophet/seer brings continuity to the message and is often multidimensional. The word, vision, or dream speaks in parallels and parables. I read, where it was mistakenly said that modern prophets don’t foretell. Only, forth tell, meaning they call those things that are not as though they were, according to what the Spirit shows them is God’s will on earth. This is true, but as far as the foretelling goes, you would have to explain that to St. John who wrote the Revelation of Jesus Christ, from an encounter he had on the Isle Patmos. In it he “foretold” the last days. Also, in the new testament, after the ascension of Christ, (in case that makes a difference for someone) A prophet fore told of a famine. Because of that the church was able to prepare for it. The prophet of God is capable of foretelling to warn God’s people in order that they might watch, and pray, to be diligent in their walk with him, and to be sober. Often times we are used to give words of knowledge regarding future events, in order to be prepared for a storm, or famine in the land. This is God, through His Holy Spirit, giving us instruction to do what we need to do, to best process, live through, and apply wisdom in the days ahead. Another form of foretelling is often found in a dream, or prophecy, that details an event that can only be seen after the matter, in other words it is only seen in retro-spec when a sign is enigmatically wrapped in a prophetic word, or more often in a dream. This is what I call a prophetic marker to pay attention to the message of that dream, vision, or prophecy. So the message is actually more important than the prophetic markers in it, those markers are there to point to the season we are in, when we begin to see them. This is for us to pay attention to what has transpired. The old testament is full of that kind of prophecy, in the stories of the patriarchs, in the books of the prophets, in the psalms, hidden prophecy describing Jesus the son of God, even paralleling end time events. There is one on this site written about called The Tall Ship Bounty and Sandy Enigmas. These are historical events that recycle themselves as messengers for the days to come, in hidden enigmas the wisdom of God unlocks through his prophets of the day. One famous harbinger written about in a best seller book called The Harbinger https://www.facebook.com/TheOfficialHarbinger Points to events surrounding 9:11 that every American should read. Prophets who use the prophetic gift for their own gain, fame, or profit, will be judged. All that the seer/ prophet is to accomplish in all of his “seeing” is for the purposes of God to bring glory to his name, preaching the Gospel of reconciliation through His Son Yeshuah, the Lord Jesus Christ.